In 2014, it finally became legal for couples to get married at outdoor locations. Previously, civil marriages and partnerships had to take place in a fixed structure – a place with four walls and a roof. Now, hotels and country houses etc. aren’t the only viable alternative setting for civil marriage ceremonies. Seaside landscapes and beautiful gardens can also be the set for exchanging vows. Registrars only perform marriage ceremonies on weekdays, Monday to Friday, so weekend ceremonies are not an option. Friday weddings are very popular, especially if you want to spend a few days with your friends and family after the wedding day or extend the celebrations with a wedding after party. Ireland is very flexible about the venue where the ceremony will take place. There are no restrictions in terms of counties or districts where the wedding can be celebrated. 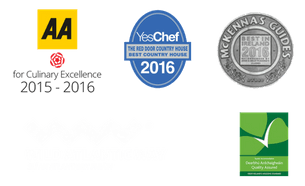 Being resident in a certain district, for example, is not mandatory and couples can choose among several registered listed venues. According to the legislation, the outdoor venue should be “readily accessible to the public” including guests with mobility issues and “provide an opportunity for objections”. It is also a legal requirement that the couple, witnesses, registrar and paperwork do not get wet so rain cover is important should the forecast be concerning. Regardless of whether your wedding will take place in a Registry Office or other approved venue, you must inform the local Registrar of Civil Marriages of the date and venue of the wedding ceremony. This should happen at least with three months notice from the planned date. (It is advisable to allow longer to be on the safe side.) Once all the certifications and information have been submitted, the Registrar will issue a Marriage Registration Form (MRF) that will formally allow the couple to get married. Likewise, humanist ceremonies and other types of wedding blessings can be held outside. Date, venues and arrangements set, you are half way to finalising your wedding day. The information included in the wedding invitation is very important for setting guests’ expectations and even more so for an outdoor wedding ceremony. Depending on the season (if that makes any difference in Ireland! ), you may wish to suggest an appropriate dress code, such as ‘wear a jacket’ or ‘bring a brolly’. People appreciate this little care and will enjoy the experience even more if they are properly prepared for it. We can’t talk about an outdoor event of any sort in Ireland without considering a contingency plan! As the weather is so unpredictable, often from one hour to the next, there will always be a chance that your dream outdoor wedding ceremony plans have to be altered. If your ceremony is to be held in the grounds of a hotel or country house for example, ensure that there is an option to hold the ceremony inside if the weather is unfavourable. A marquee is also a compromise for outdoor wedding ceremonies and is also now a legal option thanks to the legislation update. The weather forecast on the day before the wedding will usually determine the final plans! The Red Door Country House is the perfect option for outdoor wedding ceremonies. 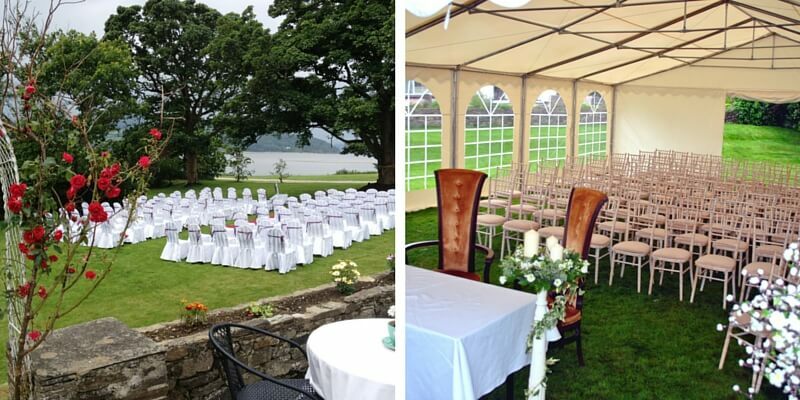 It is an approved civil wedding ceremony venue and the gardens stretch down to the banks of Lough Swilly so you can exchange your vows overlooking this beautiful sea inlet and the picturesque Inch Island. If the weather isn’t co-operating, you can avail of our marquee with various options of roof only or with sides so you can still experience the magical outdoors. Likewise, our beautiful restaurant offers the same wonderful views for the couple and all guests from the heat and comfort of indoors. Civil Marriages are subject to approval by the Health Service Executive (HSE). The local office for The Red Door Country House is Letterkenny. If you are looking for an indoor or outdoor wedding ceremony venue, where you can continue your reception celebrations, get in touch with us and we will be delighted to discuss the options with you.